An interesting turn of events and it looks like the league is about to get more exciting! Defending Champions Pythons now see a strong challenge in the Sharks, heating up the rivalry between the three teams. How will this tournament fare now that the Sharks have sprung back into action from their last match and the Pythons will now face the Bandar Blacks this week? We can only speculate that tactics and strategies are probably now being refined, reviewed, and modified because this year’s tournament, ladies and gentlemen, may end with surprises. Battles are hard fought and currently, it isn’t over. We wish the KB Pythons and the Bandar Blacks the best of luck! Read on about last Saturdays match on the Brunei Times article below and check out the photos of UBD Sharks vs KB Pythons match at: http://faiqairudin.com/b/kbpythonsvsubdsharks/ Courtesy of Faiq Airudin. Catch the next game as the next match will be the KB Pythons against the Bandar Blacks this Saturday! 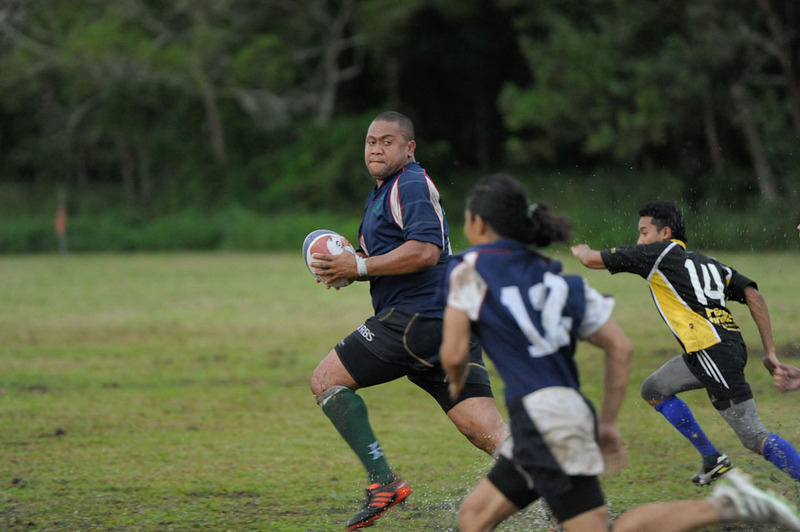 For more updates, hear them here in Brunei Rugby Online. UNIVERSITI Brunei Darussalam (UBD) Sharks are back on track in the Brunei Senior Rugby League (BSRL).The Sharks took down Belait Pythons with an emphatic 17-13 win at the UBD Sports Complex in Tungku Link yesterday. Bouncing back after an embarrassing 22-3 defeat at the hands of Bandar Blacks in the BSRL opener last Saturday, their first win of the season was an important morale boost for the team. Dominating the line-outs, scrums, rucks and mauls, the Sharks were hoping to prove that last week’s loss was a one-off incident. The Sharks has a brilliant start, penning their opponents inside their own 10 metre line to start the game. They could have scored as early as the five-minute mark had they made use of their fast backs and wings. The Pythons were lacking in focus and it cost them dearly. They allowed Sharks to score a try (with conversion) and a penalty in the first half. The Sharks would add another try and conversion in the second. Their numerous missed tackles and unorganised defence led to their downfall. Their forwards could not keep up with the Sharks whose superb pace and passing earned them their first win over Pythons in three years. “We waited three years to beat the Pythons. The first ten minutes we were on their half, we keep on pressuring in the game and forced them to mistakes,” said Sharks backs Lim Shen Quan. Earlier in the game, Quan broke the deadlock when he stepped up to convert the penalty to give Sharks a 3-0 lead. Pythons replied with a try of their own but failed to score the conversion before Nurul Safuan Md Ali scored the first try for UBD Sharks in the season to lead 10-5 lead heading into the break. The second half saw and Julian Edward Penstone score the try after they were awarded a penalty by referee Clifford Chin following a dangerous high tackle by the Pythons player. Sharks made use of their solid defence in the second half to hold on to their 17-13 lead for the win. “They put everything in the game, they played really well, it is a very important game for us because we lost against Bandar Blacks last week, so we have to win this game just to stay in the competition,” said Sharks coach Shafiq Kamalie. “The boys came out and they came through and it was hard, and today we were lucky to come away with a win,” he added.